Boeing said Tuesday the first orbital test flight of its commercial crew capsule, named the Starliner, will be delayed until August “in order to avoid unnecessary schedule pressure” and give priority on the Atlas 5 rocket’s manifest to a U.S. Air Force communications satellite. NASA confirmed Wednesday that officials have approved an extension of the Starliner’s first crewed mission to last up to several months. 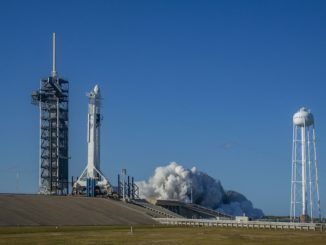 As expected, NASA announced Wednesday that the first unpiloted test flight of a SpaceX Falcon 9 rocket and a Crew Dragon astronaut ferry ship has slipped from later this month to March 2. 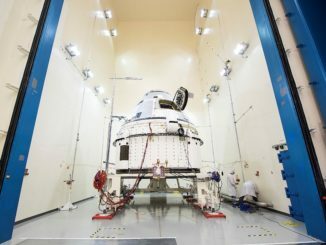 The first unpiloted flight of Boeing’s Starliner capsule is now targeted for the April timeframe. 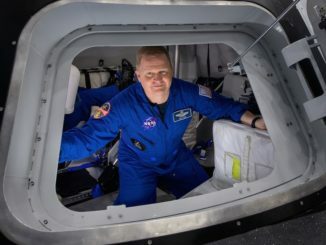 Eric Boe, one of three astronauts assigned to the first piloted test flight of a Boeing CST-100 Starliner commercial crew ship later this year has been removed from the mission due to unspecified medical issues, NASA announced Tuesday. He will be replaced by veteran astronaut Mike Fincke. 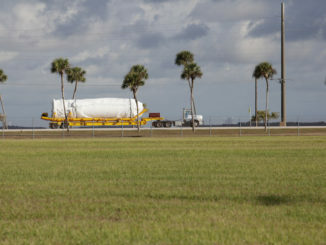 The Centaur upper stage destined to send Boeing’s CST-100 Starliner crew capsule into orbit on its first unpiloted test flight next year has arrived at Cape Canaveral after a sea journey aboard United Launch Alliance’s Mariner transport ship. 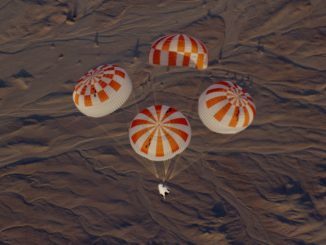 NASA safety advisors on Thursday lauded hardware milestones on Boeing and SpaceX commercial crew capsules, but said multiple technical issues, including problems with parachutes, must be resolved before the human-rated ships are ready to carry astronauts, adding that both companies continue to pursue schedules that appear to be unachievable. 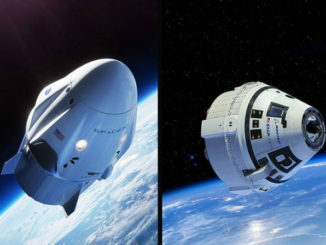 NASA has released new target dates for test flights of commercial crew capsules in development by SpaceX and Boeing, with unpiloted demo missions by SpaceX’s Crew Dragon and Boeing’s CST-100 Starliner spaceships now scheduled for January and March, followed by crewed orbital missions in mid-2019. 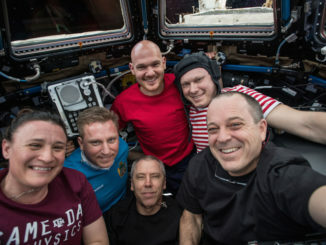 An impromptu repair job Thursday appears to have stopped a leak in a Russian Soyuz spacecraft docked to the International Space Station, and the crew was back on its normal schedule Friday carrying out research and making preparations for the arrival of a Japanese cargo ship next month. 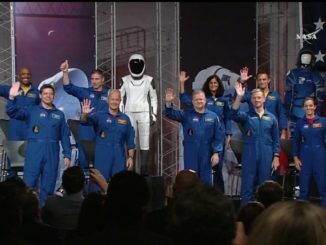 NASA announced Friday a mix of spaceflight veterans and rookie astronauts who will launch on the first flights of new Boeing and SpaceX commercial spaceships starting as soon as next spring, several months later than previously scheduled. 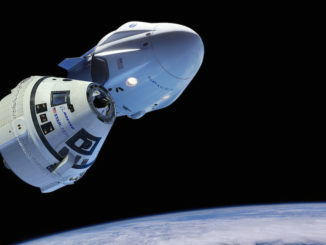 NASA is announcing the astronauts who will fly the first crewed test flights of the SpaceX Dragon 2 and Boeing Starliner capsules next year. The event at the Johnson Space Center is due to get underway at 11am EDT (1500 GMT). 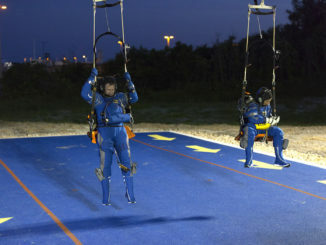 Several NASA astronauts, plus Boeing test pilot Chris Ferguson, recently participated in a training session at Cape Canaveral, practicing how they would evacuate from the Atlas 5 rocket’s launch pad in the event of a countdown emergency.